Understanding the performance of energy, environmental and chemical process devices based on multiphase flow physics is very challenging. Having the means to impact their design early in the developmental process is critically important to control costs and reduce the risk of not meeting performance standards. About 75% of the manufacturing cost of any product is committed at the conceptual design stage, even when the incurred cost might be very small. Computational models can be used to simulate a multiphase device to help understand its performance before the design is finalized thereby reducing cost. Computational models provide valuable information wh en reactors at the appropriate scale have not been built. Furthermore, it is well known that traditional scale up methods do not work well for multiphase flow reactors. These factors point toward the critical need for science-based models with quantified uncertainty for reducing the cost and time required for the development of multiphase flow devices. NETL’s Multiphase Flow Science (MFS) research program is a strategic combination of computational and physical models of reacting multiphase flows whose purpose is to provide validated science-based modeling tools. 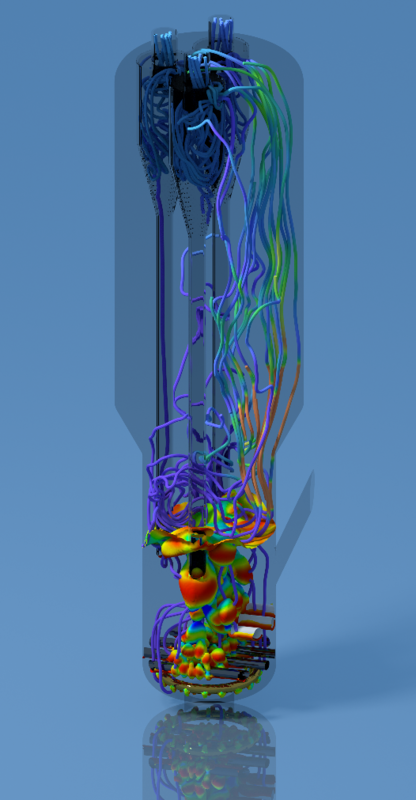 MFS research at NETL is performed by a crosscutting team of 30 engineers and scientists, skilled in the development and application of multiphase computational fluid dynamics (CFD) software and multiphase experimentation, who collaborate with researchers from U.S. and International multiphase flow academic and industry research programs. MFS research and development at NETL is funded by U.S. Department of Energy programs, primarily from the Office of Fossil Energy. The work emphasizes energy and environmental applications including: gasification, carbon capture using solid sorbents or liquid solvents, and chemical-looping combustion of gaseous and solid fuels. Exascale software development is supported by DOE’s Office of Science and National Nuclear Security Administration through their Exascale Computing Project. MFS research also supports DOE’s Office of Environmental Management for analysis of thermochemical processes for environmental remediation of radioactive wastes. MFS research and development combine development and application of multiphase CFD models with small-scale, well-resolved experiments to develop accurate models and to provide validated computational tools. These tools and experimental data are made available to the multiphase flow science community as open-source software and public domain datasets. Central to NETL’s multiphase flow reactor modeling effort is the laboratory’s multiphase CFD software suite called MFIX, developed specifically for modeling reacting multiphase systems. This open-source software suite has over three decades of development history and more than 5,000 registered users worldwide. The physics from MFIX has been incorporated into leading commercial CFD codes, making it available to many users from industry. It has been applied to an extremely diverse range of applications by its users. Within DOE MFIX has been used for the design or troubleshooting of multiphase flow reactors for fossil, bio, nuclear, and solar energy processing and nuclear waste treatment. The successes achieved in modeling such complex problems have led to new and improved models that are now available to the modeling community. Details about MFS and MFIX can be found at https://mfix.netl.doe.gov.